faith and spiritual traditions. These experiential offerings include silence, chanting, singing, prayer, and more. Resilience, Justice, Forgiveness, Difference, Renewal, and Stewardship. Click individual offerings below to learn more about each month's offering and register to attend. For the month of September, the Rothko Chapel presents a contemplative practice around sharing stories one year after Hurricane Harvey. For the month of October, the Rothko Chapel presents a meditation on the topic of "Difference" in the Jewish tradition, led by Rabbi Dan Gordon of Temple Beth Torah. In response to the barrage of hate incidences occurring across the country, most recently at the Tree of Life Synagogue in Pittsburgh, Imam Wazir Ali reflects on forgiveness and reconciliation and the many difficult questions we ask ourselves on this universal topic. For the month of December, the Rothko Chapel presents a contemplative practice on the topic of "Justice," led by Rev. Francene Young of St. Luke the Evangelist Episcopal Church. The Rothko Chapel honors the start of the New Year with the sound of crystal bowls resonating throughout the Chapel, led by yoga teacher and Bayou Bliss Yoga founder Dana Shamas. 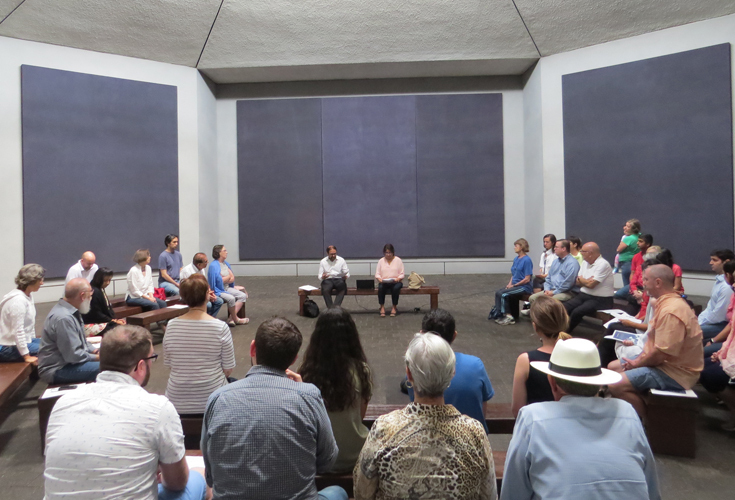 For the month of February, the Rothko Chapel presents a meditation on the topic of "Stewardship" in the Zen Buddhist tradition, led by Mary Carol Edwards.